Thread: Possible virus blocking internet access & startup problems?! I'm hoping someone can help me with my Mom's computer -- I'm afraid there's a virus. Help2Go got me "Un-hijacked" twice last year, so I know you're the folks to go to for aid and comfort. E-machines model T5234, 4GB HDD, 1GB RAM, Vista Home Premium 32-bit SP2. We have the original E-machines Operating System Disc if needed, CCleaner has been run. Startup attempt 1: The computer gets through the black/white "e-machines" logo screen, then shuts off. Startup attempt 2 and beyond: straight to "startup repair" or "start Windows normally" options. Choose either, it shuts down. My Mom felt that the problem began shortly after a seemingly legitimate e-mail from Amazon (which turned out to be fake). "Startup Repair" restored the computer to an earlier point in time, Windows Updates were re-downloaded. No change. After Advanced Boot Options > Repair This Computer, then re-installing Windows Updates, the computer will no longer connect to the internet, and there's no access to Norton Security (icon missing from tray, clicking desktop shortcut or program menu icon does nothing), along with the original startup problems. Tried "Repair This Computer" for a third time, but with no updates of any sort (Windows or otherwise), since there's now no internet. No change in any symptom. Called Optimum and determined that the modem is fine, the internet connection is fine, but there is something in the computer that blocks the browser (IE and Firefox) from connecting. Further proof that the internet connection is fine is that my laptop is using that connection to post this message. I've probably missed things in this confused description, let me know what else you need. Thanks a million! Thanks for getting back to me, I appreciate any and all time you can spend helping out since this is completely over my head!
? C:\Users\Lore\AppData\Local\Temp\mbr.sys The system cannot find the file specified. ! Downloaded and ran TDSS -- nothing reported, no log generated. Downloaded and ran ComboFix. 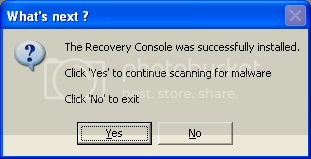 Had some difficulties, since ComboFix stated that Norton scanners were active. I couldn't access Norton to disable it, so I ran the Norton Removal Tool (supposedly with success). ComboFix said Norton scanners were still active, but I ran it anyway. Log below. Since running ComboFix, the internet connection has been restored and I was able to re-install Norton. As of this moment, all seems well, computer starts up in a normal fashion, Norton is accessible and the internet connection is back. Fingers crossed that this continues! Glad to hear things are better. Let's run a couple other scanners to make sure nothing else is leftover. MBAM log below, no threats (therefore, no log) from ESET scanner. Norton is fine, getting online is fine, but we're back to a problem on startup (shuts down right after e-machines splash screen, or goes to "startup repair" which will get the computer to boot, but only until the next time it is shut off). Perhaps the problems were coincidental? The startup issue is hardware/software related, and the missing Norton/internet access was malware? Let me know what you think, and I'll post on the computer board for help with the startup issue. Let's try a couple of internal windows tools to see if they help. 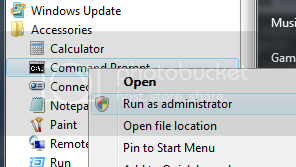 If you have the User Account Control (UAC) enabled you will be asked for authorization prior to the command prompt opening. You may simply need to press the Continue button if you are the administrator or insert the administrator password. If any files require replacing SFC will replace them. You may be asked to insert your Vista DVD for this process to continue. This can be done with a borrowed DVD if you don't have one. Windows 7 includes a disk checking tool called CHKDSK which is similar to the "scandisk" tool from older versions of Windows. This application scans your hard drives for errors such as lost sectors, bad sectors and corruption. How's the computer doing now?